I’m sure this blog post will lead California authorities to turn over the Chronicle’s fact checkers for a good old-fashioned tar and feathering at Winslow Green. Fudging the facts on one of Bainbridge Island’s proudest moments is deserving of nothing less. I delved deep into the history, tracking down eyewitnesses to pickleball’s founding moments. If only the Chronicle had a subscription to the Bainbridge Review. Those fact-checkers would still be prancing freely about Frisco with flowers in their hair. Pickleball’s name is actually derived from the Pritchard family’s maritime pursuits rather than its canine pets. Frank Pritchard, another of Joel Pritchard’s kids, said the name may have come from his mother, Joan, who was a competitive rower on the island. She sometimes referred to the ‘pickle boat,’ the slowest vessel in a race. 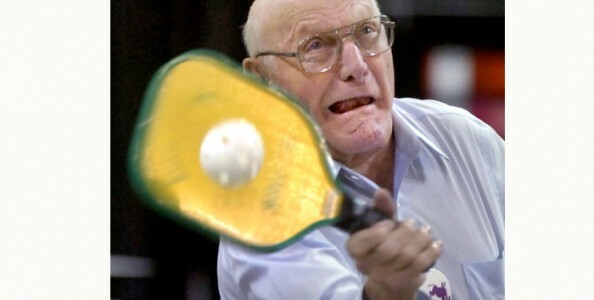 “Nobody remembers how it came to be called ‘pickleball,’ but I think somebody needed a reason why it had that name and the dog story sounded good and eventually stuck,” Frank Pritchard said in 2005. The name of the game became Pickle Ball, after I said it reminded me of the Pickle Boat in crew where oarsmen were chosen from the leftovers of other boats. Somehow the idea the name came from our dog Pickles was attached to the naming of the game, but Pickles wasn’t on the scene for two more years. The dog was named for the game, but stories about the name’s origin were funnier thinking the game was named for the dog. In an oral history published by the state in 2000, Joel Pritchard (that’s a rare pickleball-playing picture of him over to the left) said the tall tales about the sport’s name originated with an out-of-town reporter…and a few imaginative locals…and his own willingness to hush-up when a good story takes hold. Interviewer: There are several accounts about how you named the game. Is it true you named it for your dog? Joel Pritchard: We needed a nutty name like Pickle-Ball, but, no, the dog was named after the game. A reporter came through and was doing a national story on the game, and somebody told him that story. Everybody said, “Shut your mouth. It’s a good story. It works better, leave it alone.” It’s like a lot of stories. And a lot of stories have included the Pickles-the-Dog Genesis Theory, including ones on National Public Radio, the Denver Post, Wikipedia and numerous small papers across the U.S. and Canada. Even a few nearby papers (Bellingham Herald, Everett Herald, Spokane Spokesman-Review) have included stories about a scampering spaniel inspiring the Pritchards to name a sport after it. But the myth is most powerfully perpetuated by the shadowy forces of pickleball officialdom. The Pritchards had a cocker spaniel named Pickles, who became interested in this new game. Whenever a ball would come his way, he would take the ball and run off with it, because you see, it was Pickle’s ball. And that is how the game got its name. And the USA Pickleball Association’s sticking to it. Back when I wrote that Review article, I sat in on a few matches played by a certain someone who happens to be a high-ranking USA Pickleball Association official. I mentioned that Joel Pritchard’s kids told me the dog story was bunk. The pickleball bigwig got a queasy look. Thanx for the heads-up about the name of the game with the funny name.Regardless if it were named for a boat (Mrs. P’s version) or a dog (Reporter’s trumped-up version; and attested to by the inventor)it is still a game with a funny name!!!!!!!!! My dad was a friend of Joel Pritchard, and he told me that many years ago,Joel had seen crewmen off of a Japanese ship batting a ball around on one of the piers in Seattle and that, along with Joel’s kids looking for something to do, started the idea of Pickle-Ball.When my family moved here 25 years ago, one of the first things my dad did was have a regulation Pickle-Ball court built. Countless hours of friendly, hard fought battles have taken place on our court over the years. My wife and I have pretty much retired from the game but back in the day,only my cousin Jack could beat us with any regularity. We were good! Besides home court advantage, we were the ‘keepers’ of the rule book and fast talkers and had a lot of fun trouncing all comers. We were shameless! We used to leap up in the air and slap paddles whenever we scored while playing doubles. One friend used to challenge me all of the time,and he rarely won, blaming his losses on. “the sun was in my eyes,my shoes are too tight, you are cheating,blah blah blah.” He went so far as to have his own court built and used to try and get me to come play but I told him, “No thanks. I’ve got my own court.” What a great game. I continue to be amused by the pickleball naming debate. I would tend to believe Mrs. Pritchard. After all, Mom’s never lie. Pickleball Rocks! I also believe Mrs. Pritchard…and Peggy Pritchard (who was also there)… and Mr. Pritchard (the man who invented sport). All of them say its not named after the dog. So why is there any debate at all? Who’s more credible than the family that invented the game? I’ll leave it to you to do your duty and quash these infernal lies.